These address common questions and solutions when troubleshooting the Phore wallet. Q1. My wallet crashes often or has crashed and now won’t launch. How do I fix this? An abnormal exit of the wallet could result in a blockchain inconsistency from that point onwards. This can happen due to a PC crash or reboot without first fully closing the wallet, or if the downloaded blockchain somehow got corrupted and caused the wallet to crash. If users experience wallet launch failures, try using the -forcestart startup flag (e.g.In Windows OS, you need to edit the shortcut and append it at the end) which will bypass the new procedures altogether, and in rare cases allow the wallet to run. If the wallet startup issue is not fixed with the -forcestart flag, the user should resync the blockchain as per steps below. As you are not deleting the .conf and wallet.dat file, this will not affect your coins or your masternodes. Now re-launch the wallet. Wait for it to Sync. This can take few hours on slower internet connection. Also, it is recommended that after a successful full resync, make a backup of your good blockchain as this “good” blockchain snapshot could come handy later and means you’ll be able to avoid a full resync if your chain gets corrupt again. To make a backup of the good blockchain, follow the steps outlined in Q5 below. 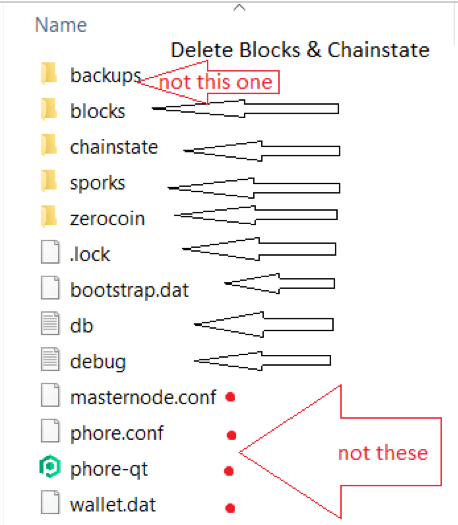 If you face a corrupt blockchain again, just delete the 2 folders chainstate & blocks only, copy over the good backup blocks & chainstate folders, then restart the wallet. Q2. My wallet appears to be stuck syncing the blockchain and remains at X hours left. It’s been many hours and the status hasn’t changed. How can I fix this? Connecting to some bad peers or your chain becoming corrupted somehow can cause blockchain syncing to stall. First, try shutting down and restarting the wallet, and after it’s synced up, check if you are on the right blockchain as per Q6 in this FAQ. If you are on the right chain but it still isn’t syncing the newer blocks, please follow solution steps outlined in Q1 above to resync cleanly off the network with a new peers.dat. Also, ensure that your phore.conf doesn’t have any connect= or addnodes= lines, unless you know why they are there and you put them in there for a good reason. To check phore.conf, look in the folders listed below in Q3. Q3. Where is my wallet.dat, blockchain and conf files located? **Q4. Are there Phore blockchain snapshots that I can download so that I don’t need to sync the blockchain over the network? Phore does not currently provide any official snapshots. We recommend that everyone sync their wallet initially over the network to help ensure that it is 100% accurate and has not been tampered with. If you want to, you can then make your own blockchain snapshot for future use any time you want (see below). Q5. How do I make a backup of the blockchain so I can avoid a full resync if something goes wrong? As the Phore blockchain grows, it will take an increasingly longer time to sync the blockchain from the beginning. While we feel it is important to do this initially to obtain a trustworthy copy of the correct Phore blockchain, you can avoid having to do full resync by making your own Phore blockchain snapshot. Start the wallet again and continue using the Phore wallet. If your snapshot was done properly, it will start syncing from the time you took your snapshot. Q6. My staking or masternode reward is a different amount / more frequent than expected, and/or my recent transactions aren’t showing up in block explorer but my wallet is fully synced and seems up to date. How can I fix this? There is a possibility that your wallet may be not synced up with the network properly, or that your wallet may have somehow started syncing an incorrect blockchain fork and isn’t connected to the main Phore blockchain network. This is very likely to be the case if you were running a version older than v1.2.2 beyond block 250,000 when changes from a required upgrade took effect. From the debug console (Tools -> Debug Console), type: getinfo. Note the block number. That is the block number that your wallet is currently synced up to. If the hash is different, you are not on the right chain and you should update to the latest wallet release (if not already on it), restart the wallet, wait until the wallet is fully synced, and check steps 1 to 4 again. If the wallet still not matching the block explorer, follow the steps outlined in Q1 above to resync the blockchain. If the hash matched up between your wallet and the block explorer, then your wallet is on the right network. If your recipient still hasn’t received your coins, you need to ensure that the recipient is also on the right network and synced up to the latest block with no delays. If you see lots of conflicted transactions (which are not valid transactions), follow the steps below in Q7 to clear them. Q7. I see a lot of conflicted / orphan transactions as a result of staking but not winning those blocks. Is there a way to clean them up and not show them? Backup your wallet if you haven’t done so recently (this is just a precaution and not mandatory). It will now go through your wallet and within a few minutes it will find and remove the orphan transactions. Tip of the hat to the PIVX team who prepared similar answers to many of these questions.